French physician; born in Paris Nov. 25, 1841; son of Simon Hayem. He became doctor of medicine in 1868, and later "agrégé" of the faculty of Paris. In 1879 he was appointed professor of therapeutics and materia medica at the Saint Antoine hospital, and in 1886 was elected a member of the Academy of Medicine. He is the author of many important medical works, and has made extensive researches in the pathology of the blood. He is a specialist on stomach disorders, and has achieved some success in the cold-water treatment of cholera. His most important works are: "Des Hémorragies Intra-Rachidiennes," 1872; "Recherches sur l'Anatomie Pathologique des Atrophies Musculaires," 1877; "Cours de Thérapeutique Experimentale," 1882; "Leçons de Thérapeutique," 1887-93; "Du Sang et de Ses Altérations Anatomiques," 1889; (with Winter) "Du Chimisme Stomacal," 1891. 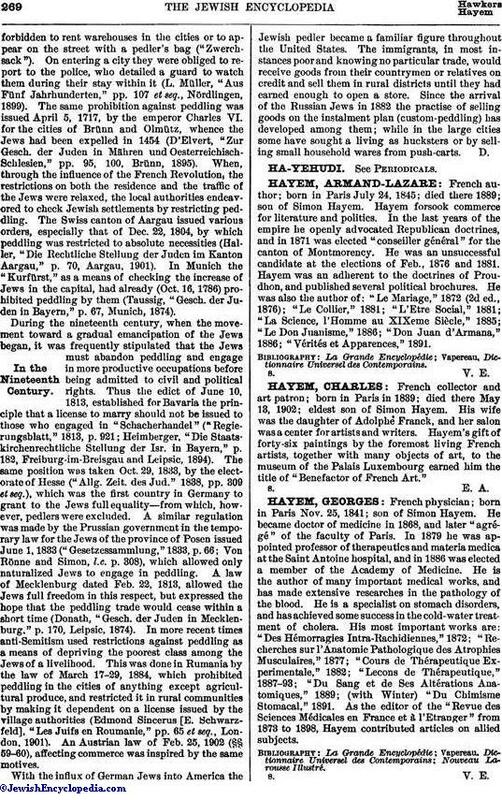 As the editor of the "Revue des Sciences Médicales en France et à l'Etranger" from 1873 to 1898, Hayem contributed articles on allied subjects.